Hand-crafted Delabole Slate Worktops...We've been making kitchen, pantry & dairy work surfaces since Elizabethan times and according to historians "it is likely that the great slate slabs used for cooking by the Beaker Folk around 2000BC came from Delabole". oversee each individual worktop order. Delabole Slate was formed by Mother Nature herself. The intrinsic beauty of this natural material is brought to life with the occurrence of attractive natural markings and subtle variations in colour. The natural variation of each and every slab and our use of traditional crafting methods, gives each item a natural and individual finish. Slight irregularities, are characteristic of this and adds to the uniqueness of your worktop. 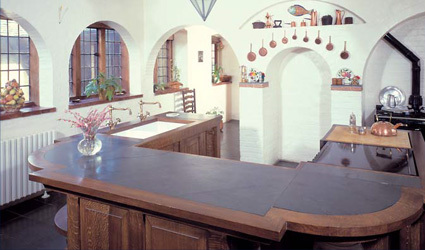 Over hundreds of years, Delabole Slate work-surfaces have been used in every conceivable application. Ideal for kitchen worktops, bathrooms, conservatories and utility rooms around the home, Delabole Slate work-surfaces are also the perfect choice for commercial projects.